As much as I love a good intellectual debate, when it comes down to it, I’m a sucker for a good reconciliation thesis—a text that searches for common ground, or at least common interests. It’s why I loved Jonathan Haidt’s The Righteous Mind, and why, despite my passions, I do my best to avoid polemics, with varying degrees of success (I think Christopher Hitchens should be required reading, while I didn’t care for Richard Dawkins’ The God Delusion, though I agree with his premise). Reading only what supports your beliefs leads to entrenchment and intellectual idleness. Equally lazy is cherry-picking only the extreme views on the opposite side, as it offers a skewed perspective that is easily caricaturized and dismissed (e.g. thinking the Westboro Baptist Church is representative of all Christians or that Ann Coulter is speaking on behalf of human beings). So it was with great interest that I cracked open (does that expression apply to e-books?) 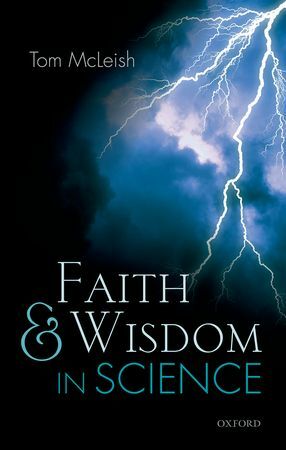 Faith and Wisdom in Science by Tom McLeish, a physics professor at Durham University. I liken it in tone and intention to Buddhist Biology, by David Barash, a brilliant book in which the author explicates his self-proclaimed Buddhist atheism. However, while Barash delivers a very personal narrative, McLeish takes a more historical focus. McLeish is a talented writer, which makes Faith an easy and enjoyable read. He explores the history of both scientific discovery and biblical narrative, finding commonalities in the ways humans in each arena are awestruck and inspired by the natural world. Here, he points out parallels, but I don’t think he presents a strong argument. Yes, people from biblical days share our fascination with reality, and myth-making was our earliest stab at explaining the world. That doesn’t mean that biblical passages are relevant to modern science. Which segues to McLeish’s strongest topic: The unfortunate divide between the sciences and the humanities. The earliest scientific studies were not the cold, heavily controlled research we have today, he writes, but passionate probes of the natural world. There has since developed a rift between the science and humanities. Science got custody of the brain in the divorce, and humanities, the heart. Somewhat tangential, though I think relevant, is an article in the Summer 2014 issue of Philosophy Now, “Are There ‘Other’ Ways of Knowing?” The author, philosophical science correspondent Massimo Pigliucci, revisits a conversation on science and philosophy he had with heavyweights Dan Dennett and Lawrence Krauss. The takeaway is that science, he writes, is too quick to dismiss non-scientific, or non-empirical, knowledge, such as mathematical knowledge, phenomenological experience and intuition (as in subconscious processing, not precognition). I found it a helpful companion to McLeish’s book, as it shows how easy it is to become dogmatic in the sciences. But to finish with McLeish, I will draw one final comparison: Cosmos. Both the original and the reboot are classics because they impart knowledge without diminishing the wonder of the natural world. In fact, I would argue that the more we learn of the natural world, the more wondrous it appears. And like Neil deGrasse Tyson, McLeish is affable, informative and, in my opinion, has written a book not so much about science and religion, but rather on that greatest of virtues that we should never lose, but often do: childlike wonder. I would love to grab a beer with Patrick Madrid. Beginning by analogizing the Catholic Church with Noah’s Ark—and not always in a flattering manner—he comes across as funny and self-effacing, and very likeable. It’s easy to see why Madrid is a popular blogger, lecturer and apologist. It’s this accessibility that will draw readers to Why Be Catholic? : Ten Answers to a Very Important Question, a short work with a lot of personality—but little to offer in terms of intellectual debate. Going into this book, I had hoped it was intended for a general audience. Unfortunately, it is directed toward the choir. 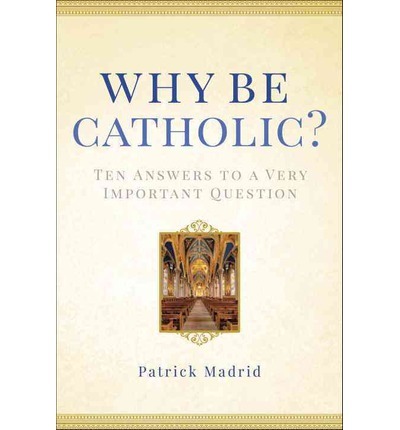 As I’m not part of the choir, I had hoped there would be a substantive argument drawing on scholarship and exegesis, but Madrid’s answers appear to have been composed to reinforce the faithful and educate believers of other denominations on the customs of the Catholic Church. It is not an argument for Catholicism for nonbelievers, but rather for non-Catholics. Madrid makes reference to atheists, agnostics and others, but never directly addresses these groups. Case in point: He mistakenly writes of the “miracle” of Lanciano that “Scientists have not been able to explain it, nor have atheists been able to debunk it.” Well, the burden of proof is on the believers, not the scientists. The church is in possession of a bit of human tissue and blood, allegedly consecrated from bread and wine ~700 C.E. No dispute there. They have human tissue and blood. So does Dexter. What proof exists that they started as tapas? But to be fair, that’s not the point of Why Be Catholic?. This book is for readers for whom issues of existence or nonexistence have already been decided. If you count yourself among them, then I recommend this book as a light, enjoyable read. For theological debate, try elsewhere. My preference would be to discuss it with Madrid over a beer. Or maybe tapas. 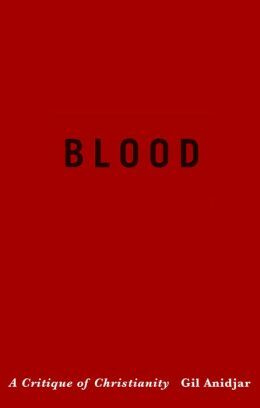 I’m not sure where to begin with Blood, except to say that it may well be defining its own genre. It’s challenging, controversial, lyrical, overly referential, meandering, meta-everything and modest. OK, I lied about the last one. This book is quite full of itself. But don’t take that as a bad thing. It’s a book that demands its own terms, and I respect any author willing to challenge their reader. Anidjar does present a challenge. The fault, though, is that he doesn’t appear to address it to the reader. Reading this felt like missing the first day of class and coming to the second with no review. There is a conversation happening that I don’t seem to be a part of. Perhaps that’s because I’m a lay reader. Academics and the many readers smarter than me may have better luck, but I struggled with this one. While that’s partly on me, there is also a lack of clarity in Anidjar’s writing. He has a penchant for winding sentences, extended parentheticals and pivots of thought that left me in the weeds. He strikes me as a brilliant thinker, but struggles with communicating those ideas. Again, this is partly on me and partly on him. This is a worthy challenge for any reader.